Since I wrote that, things in South East Queensland got scary, and violent, and extremely muddy. It's an interesting time to be living through. I'm feeling a mixture of incredibly lucky, to have gotten through unscathed, and also very very proud of the generosity of the people of Brisbane who are volunteering their little hearts out to get flood-affected people fed, clothed and sheltered. 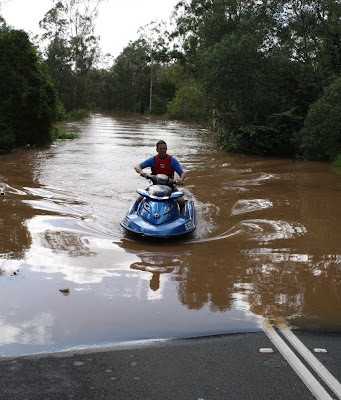 This is the first time I've ever seen anyone jetski along Mount Crosby Road. Our little bridge, our only connection to Brisbane, was 7 metres below the water at this stage. This guy was ferrying people across who were stuck on the other side. Hey Lovely. Paul and I have had a report on the state of things up your way from his fam (we are in South America). Things sound intense, glad everyone is safe and sound if not a bit shaken. There have been tragic floods and landslides here in Brazil too but we are far away from the damaged areas. Im back into the blogging thing so pop over and make yourself comfortable if you want!